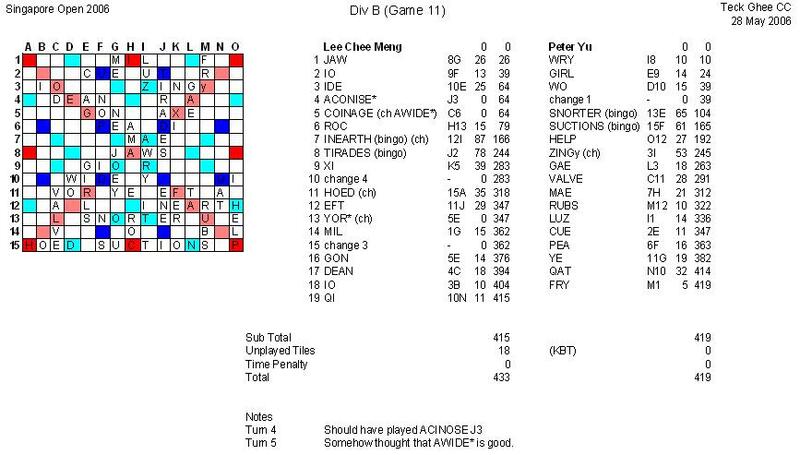 Could have formed a bingo with ADENORS on my rack and a floating "L" on the board to surge ahead but didn't. I actually thought of the word but decided that it had high chance to be a phoney. 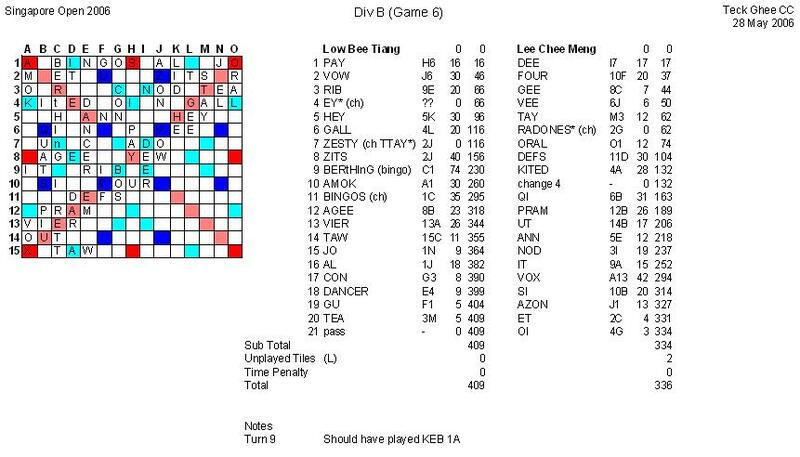 After my opponent bingoed with BERTHING(74), I should have just used up the TWS line with my "K" on my rack to form KEB 1A instead of KITED 4A for less points. 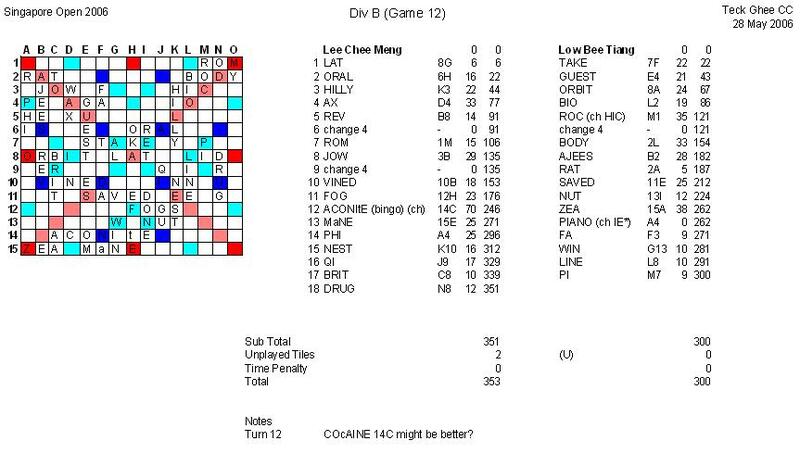 Allowed my opponent to score twice with the TWS line with AMOK and BINGOS after that. A late VOX(42) managed to narrow the gap but still lost. L 336-409, -73. 3W 3L (Accum spread -244). Played with Yao Zhong during last year's Nationals and he seems to have grown bigger and taller. Both of us got one bingo each. I played STAINED(82) while my opponent played TAVERNS(96). Was quite surprised that the bag emptied sooner than expected and my tracking seems far off than usual. Realised after the game that about four or five tiles were missing including the blank! It was too late to do anything then but we helped to replace the missing tiles from the spare bag. L 388-335, +53. 4W 3L (Accum spread -191). 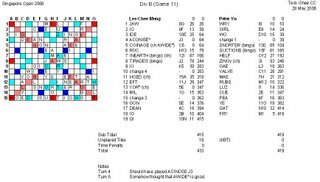 Was frustrated with a very closed board until I decided to open up with EATING 14I. Suddenly, three TWS lines were available at the same time and I was able to score well with FISH O12. 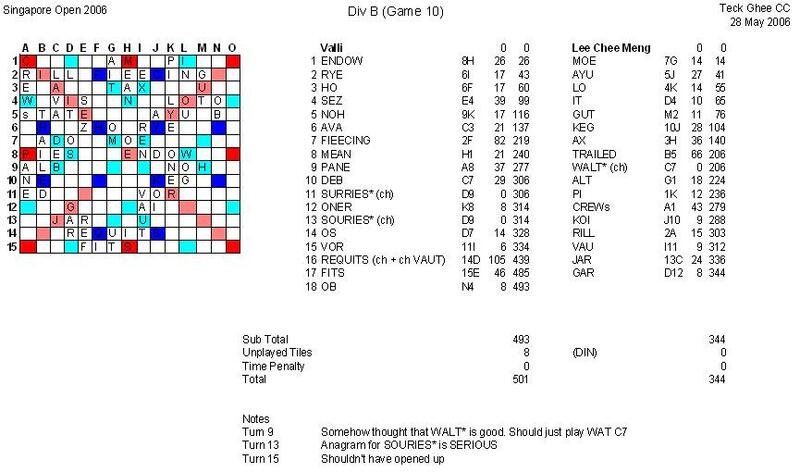 Valli was able to score on the other two TWS lines though with EXPOS and JOBS. 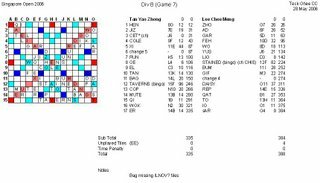 She also bingoed with LEANEST(66) and won the game. L 351-403, -52. 4W 4L (Accum spread -243). Not really sure whether to feel happy about having a bye as this means that I play one less game than I am entitled to. Had fun walking around helping people check challenged words! 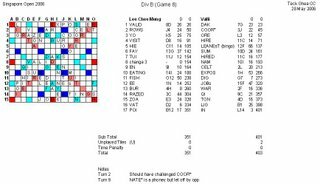 Saw Bee Tiang missing an opening bingo with a AIORTU? rack where he put OUTRAIn* and Serene missing a closing bingo with a AELPRSU rack where she put PAULERS*. W 150-100, +50. 5W 4L (Accum spread -193). Surprised to meet Valli in the KOTH round as I thought she should be somewhere on top of the field, way out of my league. 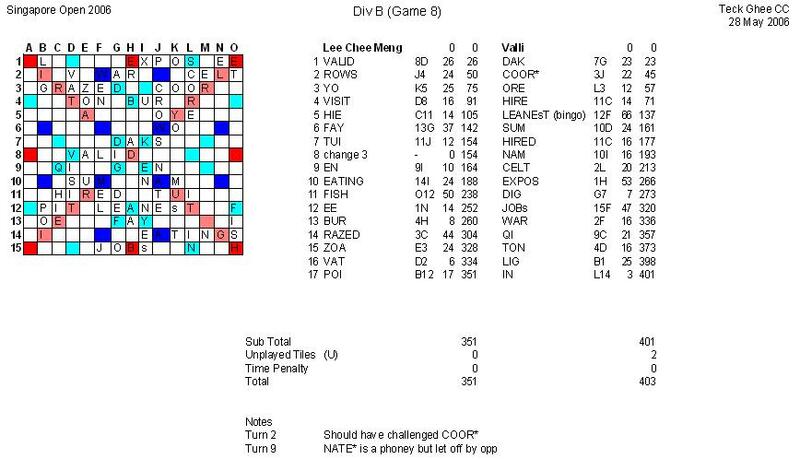 I bingoed with TRAILED(66) while Valli bingoed with FLEECING(82). She missed a few turns trying for a bingo but was challenged off. It was a very closed board towards the end and I decided to open up. Turned out to be a bad decision as she promptly put down REQUITS(105) back hooking the T to an existing VAU. 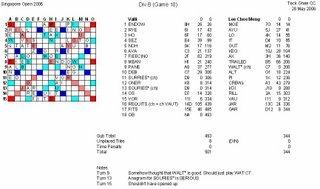 Later, she scored with FITS(46) underneath REQUITS across the TWS line and won convincingly. L 344-501, -157. 5W 5L (Accum spread -350). A game that is full of bingos! 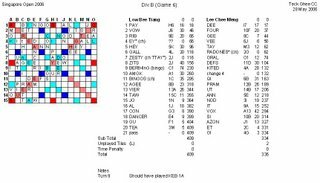 I bingoed twice with INEARTH(87) and TIRADES(78) while Peter bingoed with SNORTER(65) and SUCTIONS(61). Held a ACEINO? rack on one turn but wasted it on a phoney with ACONISE*. 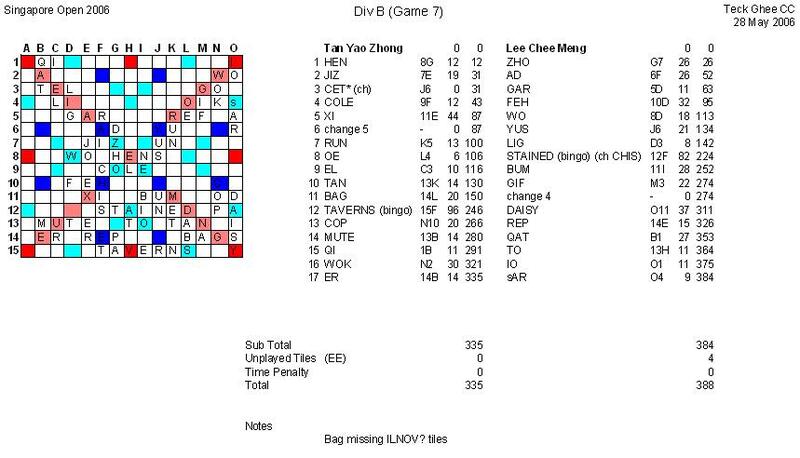 Drew many high scoring tiles towards the end and counted that there were exactly 7 tiles left in the bag. Changed my tiles and left Peter stuck with them towards the end to give me the game. W 433-419, +14. 6W 5L (Accum spread -336). Second time playing with Bee Tiang. Once again, I got an ACEINO? rack on one turn. 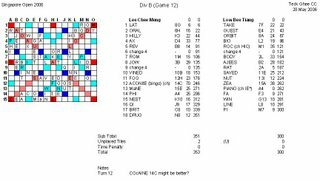 Luckily, Winston helped me check the anagrams for it with his PDA just before the game and I played ACONITE(70). Didn't have many high scoring moves after that but managed to maintain my lead towards the end. W 353-300, +53. 7W 5L (Accum spread -287). Managed to squeeze into top 10 with 7 wins and spread -287. Sad that I didn't have the chance to play with Marcus, JoBeth and Jason. Hope to have the chance to play with them sometime in the future! Game 8: COOR is no good. Challenged all her good words but missed out her phoney!